UPDATE April 4, 2011: A little press for my Luke Vibert Mega Mix from one of my favorite blogs, The Unheard Music. I’m currently participating in 3 different remix competitions. I would love your support for all of them. Please play the remixes, and spread the word on your blogs, facebook, and twitter feeds, if you like them. I’d really appreciate it. I am a huge fan of Tokyo Dawn Records. It would be very exciting to be selected for this competition. You should definitely check out all of the label’s releases; They are all good. This remix project is in support of their latest release, Amalia’s Art Slave. My remix did not make the cut. However, I had a lot of fun creating it and really appreciated the positive response that I got for the remix. If you are curious, here is the competition winner’s remix. The competition was fierce as there were over 1,000 entries. 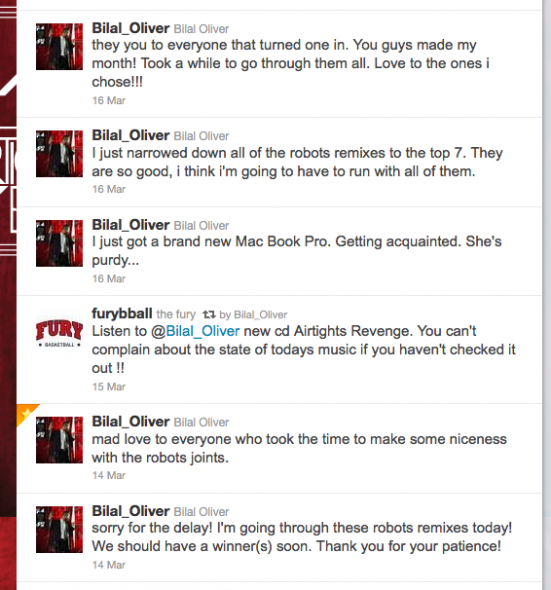 Thank you so much for your support for my entry into the Bilal’s Robots Remix Competition. You really came through for me, helping me reach 250 plays. Bilal has it down to 7 finalists; I pray to God (literally) that I am one of them. I haven’t given up hope. Please keep your fingers crossed. This would be huge for me because I am such a Bilal fan;) With the exception of Prince, he is my favorite male vocalist who is still recording (Ahem! Lewis Taylor). My samurai.fm listeners continue to astound me. At samurai.fm/polishedsolid, my best songs of 2010 mix has received over 1,000 plays, and several others over 500 plays. Pretty darn exciting for me. This entry was posted in news and tagged Amalia, Bilal, Chase & Status. Bookmark the permalink.